The Windows 10 Storage Spaces helps protect your data from drive failures and extend storage over time as you add drives to your PC. 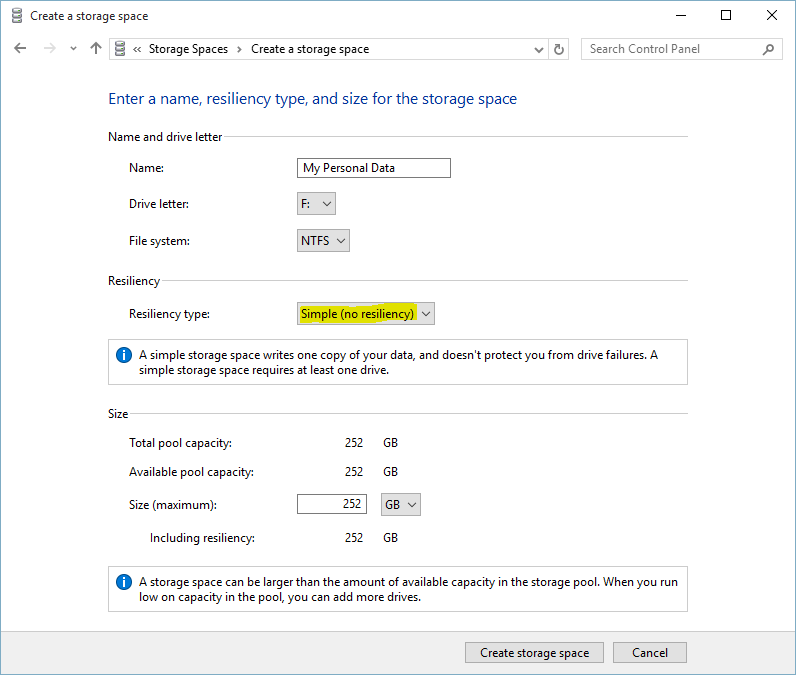 You can use Windows 10 Storage Spaces to group two or more drives in a storage pool and then use capacity from that pool to create virtual drives called storage spaces. These storage spaces typically store two copies of your data, so if one of your drives fails, you still have an intact copy of your data. If you run low on capacity, just add more drives to the storage pool. To use Windows 10 Storage Spaces, at least you need two extra drives (in addition to the drive where Windows is installed). These drives can be internal or external hard drives or solid-state drives. You can use a variety of types of drives with Storage Spaces, including USB, SATA, and SAS drives. How to Replace Laptop Hard Disk with SSD? How Do I Create a Storage Space in Windows 10? Before you configure and setup Windows 10 storage spaces, you should connect the hard disks to your computer. It is the necessary step because you are going to group two or more hard Disks with Storage Spaces feature. Type Storage Spaces in the search box, and select Storage Spaces from the list of search results. 1. To open the Windows 10 Storage spaces, just type Storage Spaces on Windows 10 search box to find Storage Spaces and manage. Click Storage Spaces to open storage space. 2. 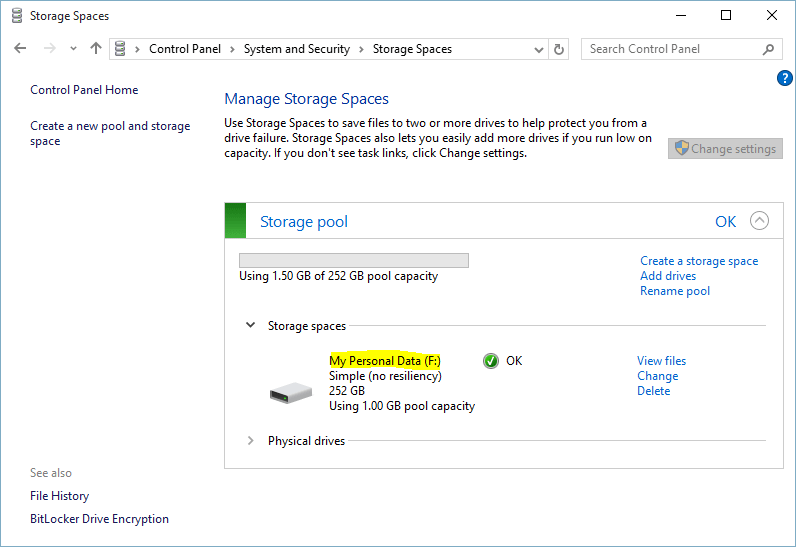 On the Manage Storage Spaces window, select Create a new pool and storage space. It will create a pool and group hard disks together to create new virtual drives. Here I have four hard disks on my Windows 10 computer. These hard disks are virtual hard disks, and I’m testing Storage Space on Hyper-v within a Virtual machine to write this article. Its a virtualized environment for server virtualization and networking virtualization. 3. Select the hard disks you want to create a pool and group together. I have selected disks 2 and 4. When you have selected the hard disks, click Create pool. 4. Now on the Create a storage space page, type a name for the drive, select drive letter from Drive letter, select File system (NTFS), choose Simple (no resiliency) as resiliency type, and specify the size of the virtual hard disk then click Create storage space. The Storage space drive has created successfully. It’s possible to view files, make changes and even delete the drive from Manage Storage Space section. How to Remove a Drive from a Pool? 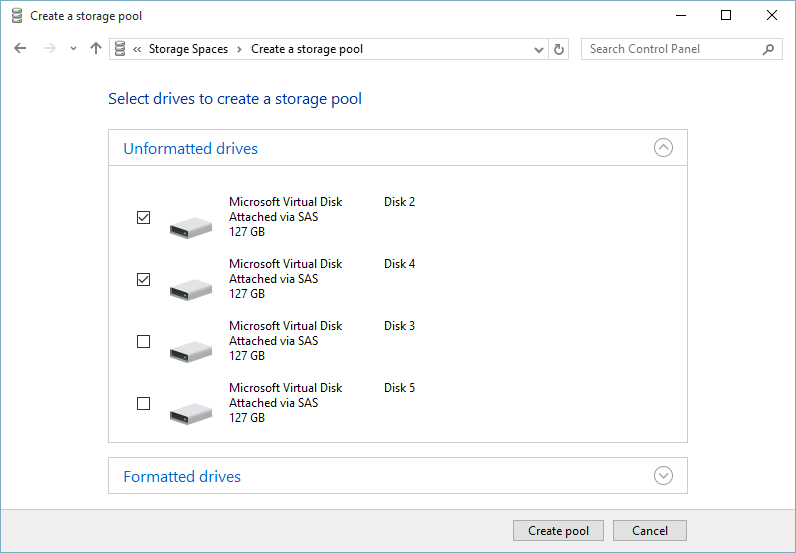 If you created a pool in Windows 10 or upgraded an existing pool, you’ll be able to remove a drive from it. The data stored on that drive will be moved to other drives in the pool, and you’ll be free to use the drive for something else. Find the drive you want to remove and select Prepare for removal > Prepare for removal. Leave your PC plugged in until the drive is ready to be removed. It could take several hours, depending on how much data you have stored there. (Optional) To speed up drive preparation, prevent your PC from going to sleep. Type Power and sleep in the search box on the taskbar, then select Power & sleep settings. Under When plugged in, PC goes to sleep after, choose Never. Which one Simple, Mirror, or Parity Space? You can create simple spaces, mirror spaces, and parity spaces. Red the differences on the below-detailed description. Simple spaces are designed for increased performance but don’t protect your files from drive failure. 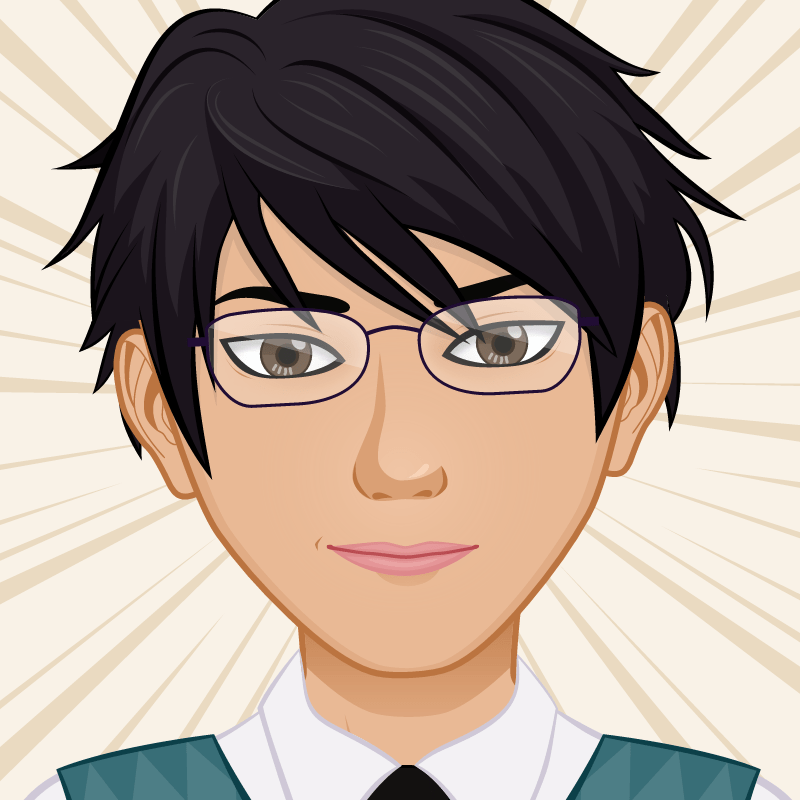 They’re best for temporary data (such as video rendering files), image editor scratch files, and intermediary compiler object files. Simple spaces require at least two drives to be useful. Mirror spaces are designed for increased performance and protect your files from drive failure by keeping multiple copies. Two-way mirror spaces make two copies of your files and can tolerate one drive failure, while three-way mirror spaces can tolerate two drive failures. Mirror spaces are suitable for storing a broad range of data, from a general-purpose file share to a VHD library. When a mirror space is formatted with the Resilient File System (ReFS), Windows will automatically maintain your data integrity, which makes your files even more resilient to drive failure. Two-way mirror spaces require at least two drives, and three-way mirror spaces need at least five. Should I upgrade my pool? After you upgrade to Windows 10, we recommend that you upgrade your existing pools of Windows 10 storage spaces. With an updated pool, you can optimize drive usage and remove drives from pools without affecting the pool’s protection from drive failure.